Published 1579 by Sigmund Feyerabend. 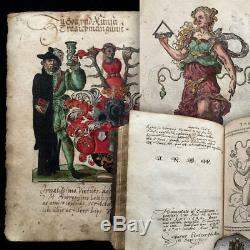 1580 Album Amicorum, Signed by Many Eminent German Theological Scholars. Bound with Monogrammist Jost Ammans 1579. Insignia Sacrae Caesareae Majestatis et Nobilium Familiarum. 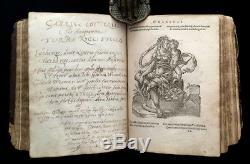 This is a 16th/17th century Album Amicorum bound with Jost Amman's. 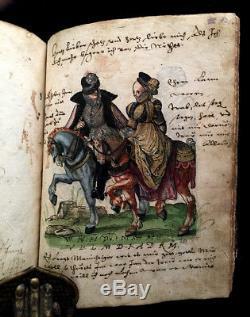 An album amicorum (Book of Friends, also German Stammbuch) is a type of autograph book collected by early modern students or scholars from Germany or the Low Countries, as they moved about from university to university. Most such books are made of paper, though there are examples on vellum. A typical page will have a tag or set of verses in Latin or Greek at the top, and below, a formal greeting in Latin to the owner of the album. Perhaps as part of the greeting there will be a heraldic shield of the signator or a small picture, often emblematic in nature, and these are sometimes colored. The work is occasionally of very high quality, and suggests the book must have been kept by the signator for a time in order to prepare the work. Most such albums are original compilations, made up of fresh sheets bound together especially for the book. 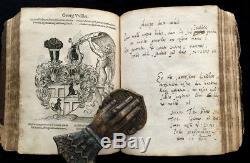 Occasionally, printed books were used as the basis for the album, with w. Orks by such writers as Andrea Alciato, Jost Amman, Theodore de Bry, Henri Estienne, Hadrianus Junius, Philipp Melanchthon, Claude Paradin, Nicolaus Reusner, Johannes Sambucus, and many others used. This Album is a particularly early example and signed by some of Germany's leading theologians of the day. 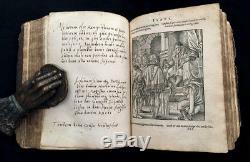 This 1579 Wappenbuch or armorial book printed by Sigismundi Feyerabendij is beautifully illustrated by the woodcuts of Jost Amman , and provides blank album pages for the owners particular use. Many of these album pages have been hand inscribed by theologians of Leipzig, Germany with lovely inscriptions in Latin, Italian and Greek. Some of Ammans woodcuts in the book are signed IA and other artists are represented by the initials MF, LF, MB, MT, CS. Five of the illustrations have been vibrantly hand-colored. Generally, the illustrations are elaborate family arms on the versos, and allegories, mythological figures, social types, etc. 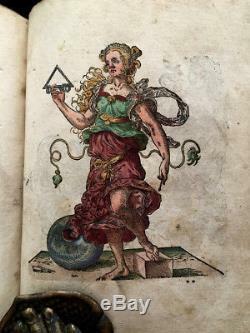 The Latin allegorical interpretations of both are by German historian Philipp Lonicer d.
The first page has been stamped Gymnasial Bibliotek Munnerstadt. The book was originally owned by a respected teacher of theology associated with St.
Thomas' in Leipzig, as well as Leipzig University. His name appears throughout the book in several languages: Hieronymus Lother, Gabrieli Lottero Grimensi, Gabrieil Lotterus, Gabriel Loeterus, Hieromimo Lothero and Gabriel Luther. Hieronymus Lotther WLVG WHVG SEMKDB. ABOUT THE MOORS REPRESENTED ON CRESTS. The scholar Jean Devise has traced the earliest uses of a Moor or a black figure in heraldry to Bavaria, the upper Rhineland, and Lower Saxony in the late thirteenth and early fourteenth centuries. The use in family and institutional crests at this time most likely reflected the spread of the imagery of the Hohenstaufen emperors, as in St. Maurice and the Black Magus, in which black figures stood in for the universalist pretensions of the Church and the Empire. From the early fifteenth century, in the context of increasing conflict against Muslims in the Iberian, Balkan, and Anatolian peninsulas and in the context of European maritime exploration and participation in global trade, including in African slaves, black figures began to take on more fantastical, exotic, and degrading features. They appeared as monsters, conquered enemies, or noble savages, serving as symbols of military accomplishment, commercial success, or conspicuous luxury. In this period black figures became a more common heraldic feature across the German lands. 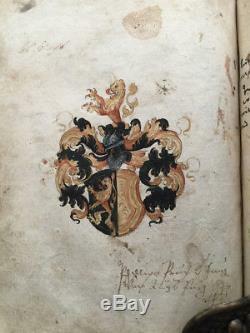 Many album pages are signed and inscribed by several theologians of the day with some connections to Leipzig University and St. Thomas School at Leipzig; at least two mention Martin Luther. 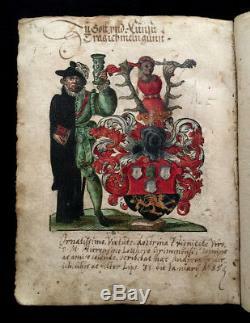 Johann Albinus , rector of Leipzig University, signed 4 October, 1580 with a full page inscription. His page references Philosophia Eclectica. Deacon Heinricus Krappius , signed on 13 March, 1609. He refers to Gabriel Luther as a revered and learned man. Deacon (Difficult to Decipher) , dated February 1609. Bartholomeus Rulich , full page inscription. Christianus (Difficult to Decipher surname) Viro Humaniss... Theologia Studioso, Singularis amicitia et memoria caicsa appo nebam Lipzig, dated October, 1608. Casparus Untzer Hallen , October, 1608 inscription beautifully written. 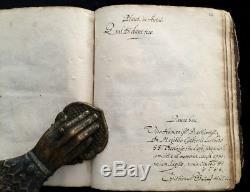 Malchior Weinrich , brother of Georg Weinrich, and a teacher / Vice Chancellor at St.
Thomas School, Leipzig, Assessor of the Faculty of Arts, with an inscription dated 9 February, 1609. The first page of the book has been stamped Gymnasial Bibliotek Munnerstadt. Prince-Bishop Johann Philipp von Schönborn founded this grammar school in 1660 in Münnerstadt for the youth of his region. After the dissolution of the priesthood of the Bartholomites about 1685, Prince-Bishop Johann Gottfried II von Guttenberg transferred the Münnerstädter Gymnasium to the Augustinians. At some point, this book made it into the school's collection, and was thus stamped. The leather cover is embossed M M L 1580. One board has heavy loss with drying and cracking to leather. Back strip from spine missing. Stringing at hinge exposed on both joints. Internally, the condition is much better. Some light foxing, toning and discoloration throughout. 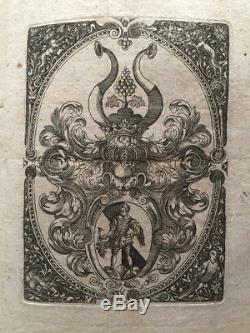 While the published book is missing "Insignia's" title page and pages A1 - A4, it was common to leave such pages out when binding as an album such as this. We collated 271 engravings as being present. The order of the engravings is mixed in some portions, though this is not uncommon in these types of albums. Book measures approximately 6 x 8 and is 1 ¾ thick. Higher value items will always be fully insured and trackable at no extra cost to you. Please note that we always collate and describe the items we sell to the very best of our ability. 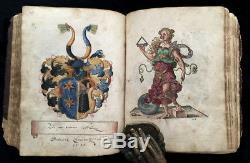 1580 GERMAN ALBUM AMICORUM Bound/W Jost Amman's INSIGNIA Book HERALDRY RARE. 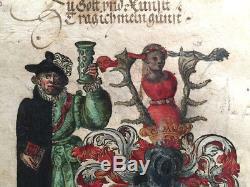 The item "1580 GERMAN ALBUM AMICORUM Bound/W Jost Amman's INSIGNIA Book HERALDRY RARE" is in sale since Tuesday, January 15, 2019. This item is in the category "Books\Antiquarian & Collectible". The seller is "regencyantiquebooks" and is located in Phoenix, Arizona. This item can be shipped worldwide.